Ilco Y160-PT Key Blanks. Wholesale Chrysler Keys. Once you understand how to check the profile, Click Here to find this key under Chrysler. Nickel plated brass with grey plastic head. This key may be user programmable via On Board Programming. Some vehicles shown above require two factory working keys to program additional keys. You cannot use a cloned key to program this key. If you only have one working key, you will need to purchase the Y160-GTK key shown at the bottom of this page. 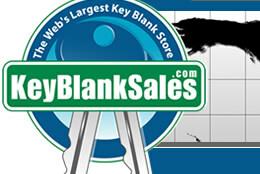 The cloneable version (Y160-GTK) of this key blank can be found below. The Y159 service key contains no transponder and will do everything but start the car.